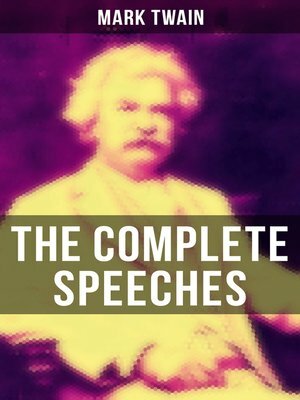 In addition to being a great novelist, Mark Twain was one of the most popular public speakers of his day. Contents: The Story Of A Speech; Plymouth Rock And The Pilgrims; Compliments And Degrees; Books, Authors, And Hats; Dedication Speech; Die Schrecken Der Deutschen Sprache [The Horrors Of The German Language]; German For The Hungarians; A New German Word; Unconscious Plagiarism; The Weather; The Babies; Our Children And Great Discoveries; Educating Theatre-Goers; The Educational Theatre; Poets As Policemen; Pudd'nhead Wilson Dramatized; Daly Theatre; The Dress Of Civilized Woman; Dress Reform And Copyright; College Girls; Girls; The Ladies; Woman's Press Club; Votes For Women; Woman-An Opinion; Advice To Girls; Taxes And Morals; Tammany And Croker; Municipal Corruption; Municipal Government; China And The Philippines; Theoretical Morals; Layman's Sermon; University Settlement Society; Public Education Association; Education And Citizenship; Courage; The Dinner To Mr. Choate; On Stanley And Livingstone; Henry M. Stanley; Dinner To Mr. Jerome; Henry Irving; Dinner To Hamilton W. Mabie; Introducing Nye And Riley; Dinner To Whitelaw Reid; Rogers And Railroads; The Old-Fashioned Printer; Society Of American Authors; Reading-Room Opening; Literature; Disappearance Of Literature; The New York Press Club Dinner; The Alphabet And Simplified Spelling; Spelling And Pictures; Books And Burglars; Authors' Club; Booksellers; "Mark Twain's First Appearance"; Morals And Memory; Queen Victoria; Joan Of Arc; Accident Insurance — Etc. Samuel Langhorne Clemens (November 30, 1835 – April 21, 1910), better known by his pen name Mark Twain, was an American writer, humorist, entrepreneur, publisher, and lecturer.